As much as we LOVE Nashville, there are certainly MANY things I miss about living in Atlanta. I miss my fun neighbors, some of the AMAZING restaurants and living in Virginia Highlands, such a beautiful 'in town' neighborhood. I am nostalgic thinking of this time last year, as I strolled little infant K up to the shops and grabbed a gelato with my neighbor. One street over from our house was the coolest little space, complete with the old tile stoop, and even better, it housed all of the fun goodies that you see here! The cute little store is called Blabla L'Atelier. 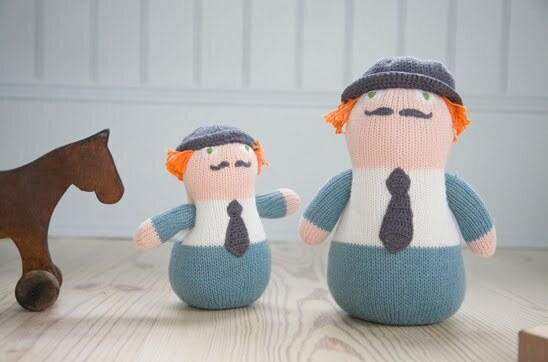 You might recognize their lovely knitted items from their catalogue and other catalogues like The Land Of Nod. They have super sales periodically, and I would always head up there for the softest knitted animals and dolls, sweaters and super soft tees. I stocked UP before K was born. Look at the ZOOK, the GIANT boogaloo! K's fav is a bit smaller, the frog, and she LOVES him! She hugs him and rocks side to side saying "ahhhhhh." It is precious. I bought the frog in 2009 at one of the super sales in the store. They even have little knitted doll clothing you can buy to dress them in. K's frog wears a pink sweater and pink and green booties. When K was born, our sweet next door neighbor brought her what would become her FAVORITE toy when she was an infant. 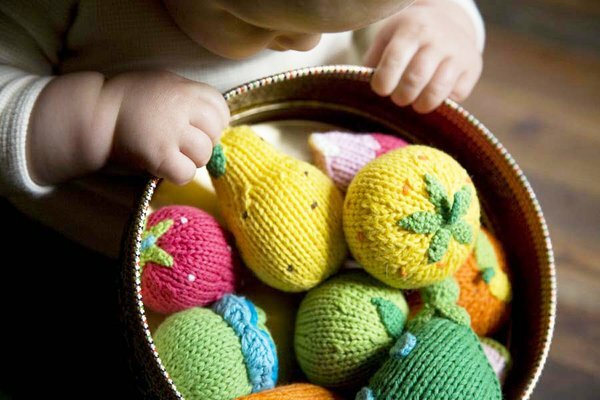 It was the sweetest little rattle knitted into a watermelon. It's been put away in her keepsake box now, as it was 'well loved' and I wanted it to savor the last shreds of it. It was so soft she liked to chew on the watermelon, hug the watermelon, and drag it with her, in the little clutch of her hand, everywhere she crawled. This is one of my favorite boogaloos, Watson. Isn't he adorable? He might be in our future. I'm a sucker for that 'stache. Look at this sweet ensemble, so stinking cute, I love that little boogaloo, Yupik. She's precious. -The bla bla kids website is offering their 'pick of the month' items for 20% off with the code green. - Blabla started in 2001 when two long time friends (Susan Pritchett and Florence Wetterwald) went to Peru. By chance, they discovered entire villages of expert knitters who had been keeping the tradition alive for generations. 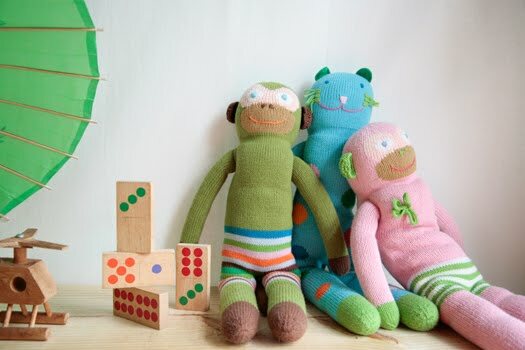 Inspired by their talent and gentleness, they decided to create their own line of knitted products for children. They first started with sweaters and hats, often with a finger puppet peeking out of a pocket. The collection now includes backpacks, dolls, booties, pillows and blankets (from Tiny Birds website)! So cute! Love the colors, too. I'm in awe of what they are doing with sock monkeys, in particular, these days! There are some really cool ones. Shari- love that little panda! It was really dangerous when I lived one street over from the store....just 'stroll' on up there...ha! I met one of the owners in yoga class one day, cool lady! I'm going to call them this week and find out when their next 'super sale' is...and maybe plan a little roadtrip back down to my old neighborhood! That's normal, right? ha ha (love your blog btw!) Thanks for reading! I will have to check them out for baby gifts. I have several showers to attend soon! I love your blog. I'm a nanny of the cutest little girl and she have the pinky boogaloo but is falling a part. I'm trying to find a new one but is discontinued. Is any chance you can sell me yours, If your children don't play with them anymore? From the earth came high style.....A FIND! PD's in Franklin....Home Decor Heaven! 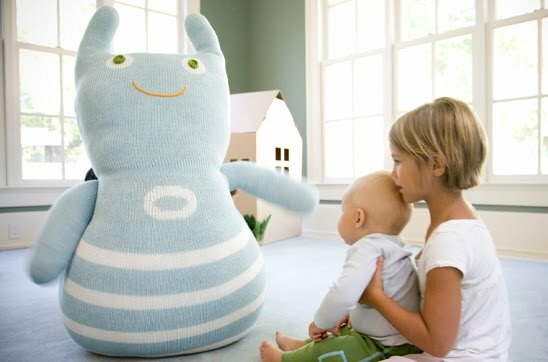 Imaginary Nursery- one day shop! Serve up some order in the bathroom! The dining chair- Weekend Finds! The BEST thing to happen to manicures!